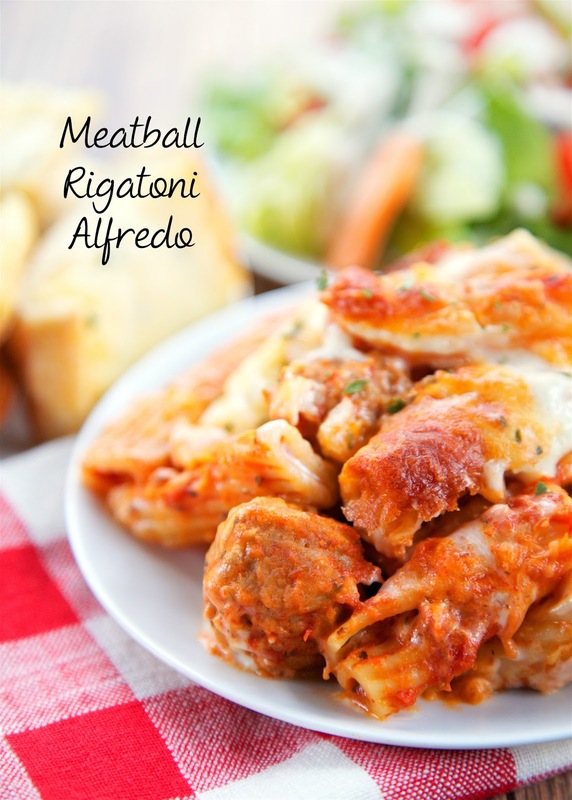 Meatball Rigatoni Alfredo - AMAZING! So simple to make - only 5 ingredients. Can make ahead and freeze for later. Meatballs, rigatoni, spaghetti sauce, Alfredo sauce and mozzarella cheese. The creamy Alfredo sauce puts this dish over the top! 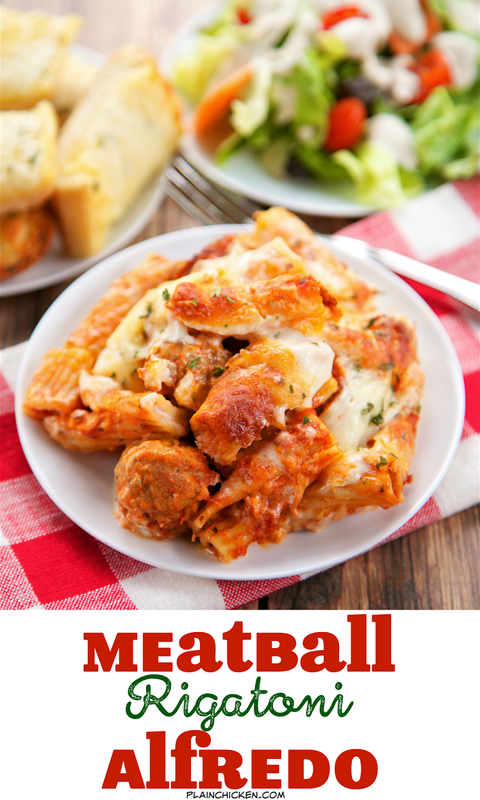 All you need is a side salad and some crust garlic bread to complete this easy weeknight meal. I love pasta casseroles. They can be made ahead of time and frozen, plus the leftovers are amazing! 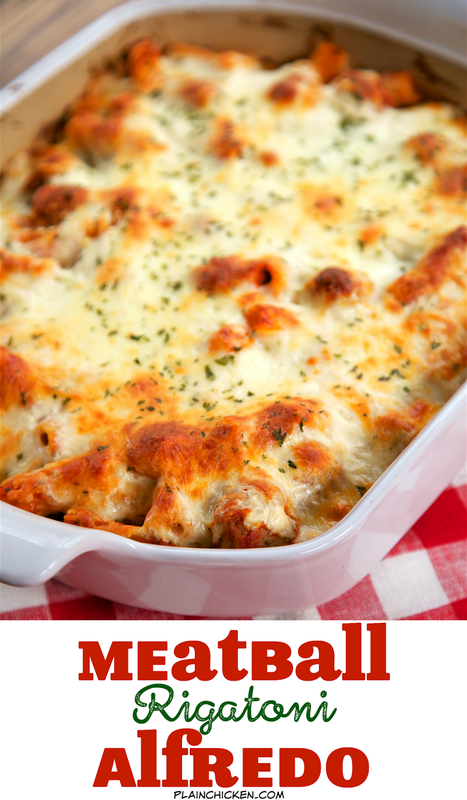 This Meatball Rigatoni Alfredo casserole is a new favorite! This is not your usual pasta casserole. 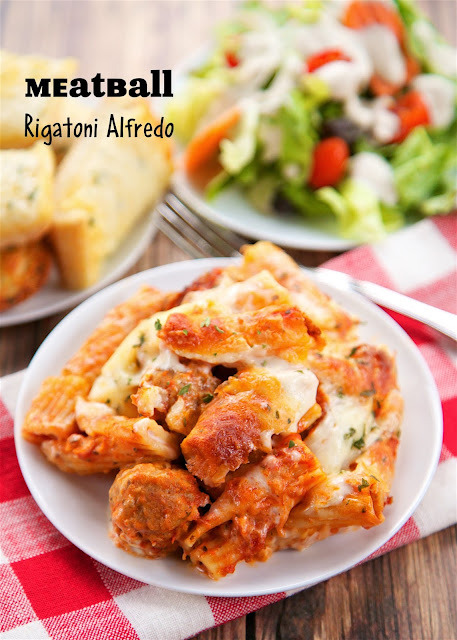 It has meatballs, red sauce and Alfredo sauce! The creamy Alfredo sauce puts this recipe over the top! This is super simple to make and tastes great. I used frozen meatballs in this recipe. You can make your own if you so desire. 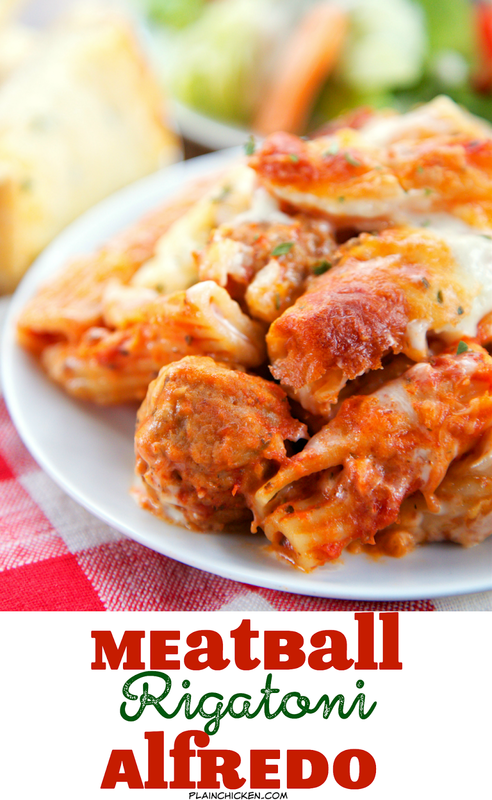 I wanted this to be a super quick and easy recipe, so I used frozen meatballs. They tasted great. We ate this for dinner and again for lunch the next day. It tasted just as good reheated the next day. All you need is a side salad and some crusty garlic bread for an easy weeknight meal. Preheat oven to 400 degrees. Lightly spray a 9x13-inch pan with cooking spray. Combine cooked pasta, frozen meatballs, and spaghetti sauce. Pour into prepared pan. Top pasta mixture with Alfredo sauce. Top with shredded mozzarella cheese. Bake uncovered for 25-30 minutes, until bubbly and cheese is starting to brown. 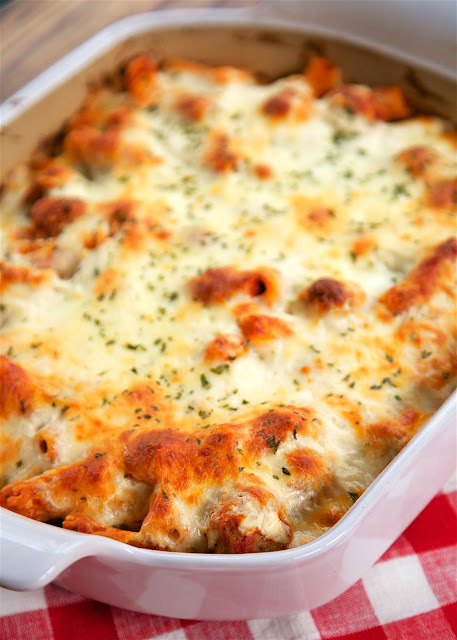 I love baked pasta dishes as well and while I've not used both red and white sauce together, your dish looks and sounds delicious. I'd like to know how many calories, fat, etc. I have both plain and Italian meatballs in my freezer...HELP! Which should I use for this recipe? Either is good. I may go with Italian just to give it even more flavor! Enjoy! Simple, budget friendly, and delicious! I used Penne in this dish because it's what I had on hand and it worked out very well. Kids loved this as well. I love how creamy and cheesy this dish is. I served it with a Caesar salad to complete this simple, yet delicious dinner.